The government spends hours discussing 700-page overviews of state functionality, remits bills, and finds that things could and should be done faster and better without making any actual decisions – as described by more than one member of the cabinet. Government sittings that should be the place for approving previously prepared, debated, and coordinated resolutions fail to produce major decisions. „Decision-making sittings are like cabinet meetings where people argue and discuss matters so resolutions could be prepared,“ one experienced minister described. He went on to describe cabinet meetings as chat rooms sporting hours worth of overviews of the situation in various narrow fields, or sessions of telling the prime minister, who does not like to read reports himself, what is happening in the world. How is it possible major things are not decided, one might ask, thinking back to last week when the government decided to abolish special pensions from 2020 and start thinking about how people could lead dignified lives when they retire in the future. 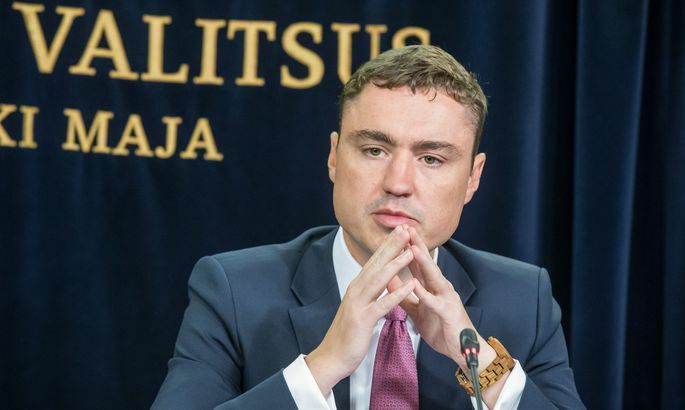 Prime Minister Taavi Rõivas (Reform Party) then took to the stage to bask in the glow of the social ministry's initiative after an abrupt drop in his party's rating and criticism of the premiere's indecisiveness. Would these decisions have been made had Minister of Social Protection Margus Tsahkna (IRL) decided against making it public before the government's discussion? There is no way to make sure now. The reason for medical workers' warning strike this week is the result of an indefinitely postponed political inconvenience. The Health Insurance Fund's budget has been in deficit for years, eating away at reserves put aside in better times. All manner of analyses made over the years scream after changes, while there are no decisions. Tsahkna looked to the future. „Major matters the government will have to tackle and must have the courage to decide include administrative reform financing, local government tasks, state reform particulars. In my administrative area we need to launch the parent's pay reform,“ the minister said. Minister of Health Care and Labor, chairman of the Social Democrat Party Jevgeni Ossinovski introduced proposals on how to find additional revenue in the health care sector already in spring. The government has not made a decision, even though the prime minister, whose government career incidentally began in the social ministry, has been briefed on analyses and the health care minister's proposals. Ossinovski expressed regret that a lot of topics the ministry and its agencies have spent a long time preparing have been put on hold in the cabinet. „Yes, there are topics regarding which there are serious differences of opinion and where corresponding decisions have become entangled,“ Ossinovski said. He gave the example of alcohol policy amendments he took to the government himself, regarding which there is no consensus in the coalition and decisions have been on hold for a year. Rõivas has delivered the most fitting description of his government: fine-tuning. In which case fundamental, future-oriented decisions would indeed be too much to hope for. Despite weekly press conferences where the government presents its achievements, Rõivas' ministers voice disgruntlement. Information available to Postimees suggests that Rõivas' indecisive, talking points-based management style has in the past earned him a phone boycott by his own ministers – ministers simply did not answer some of the premier's calls. Another source for displeasure among members of the cabinet are the prime minister's foreign visits. There are meetings the time and place of which cannot be helped that the prime minister must attend. However, it is said Rõivas has scheduled trips on Thursdays, when the government usually convenes, one too many times. One minister said that often the entire government is involved in discussing a topic that would be better served over a meeting of two or three ministers with ties to the field, instead of having all 15 members waste their time, making it impossible to reach an agreement. Rõivas has taken the opportunity to discuss a principled political matter and reach a compromise with just the chairmen of the other two coalition parties very rarely, if ever. Members of the cabinet also note with a measure of irony how important the premiere regards the following day's news headlines and what they have to say about decisions. Simson found inactivity in terms of economic recovery to be the most troubling. „For four years we've seen the finance ministry cut its growth forecasts, while always promising bigger growth next year,” Simson said. „The reality of the situation is that nothing has been done to enliven the economy in 2013, 2014, 2015, and now in 2016 and that growth is stagnant. Growth has been systematically overestimated in forecasts. She recalled how President Toomas Hendrik Ilves urged politicians to relinquish dogmas in his anniversary of the republic speech. „The most obvious dogma is the Estonian tax system that is no longer capable of attracting investments when compared to Latvia and Lithuania, while it allows foreign capital to extract its profits free of tax,” Simson said. Both opposition and ruling parties highlight the administrative reform as one major problem. „The mandatory mergers part of the reform was passed in spring. The government promised that contents of the reform will reach the floor in the second quarter. We are nearing the end of the third quarter, whereas the government has gotten nowhere with the said bills,” Simson noted. The same criticism was echoed by Free Party chairman Andres Herkel. „Everything is frozen,” Herkel said. He gave the examples of the administrative reform and negatively adjusted economic forecasts in which growth has virtually stopped (this year's growth forecast has been cut from 2.6 percent to 1.3 percent). „At the same time we continue to produce entirely non-committal documents. For example the Ministry of Justice's „Analysis of the Political System” that raised a host of problems, while the government is not planning on introducing a single bill from the so-called democracy package. A stack of papers many times as imposing yet is the „State Functions Analysis” (700 pages – ed.) regarding which it is equally difficult to highlight concrete activity plans and tangible results.